BACKGROUND AND PURPOSE: Relative cerebral blood volume (rCBV) accuracy can vary substantially depending on the dynamic susceptibility-weighted contrast-enhanced (DSC) acquisition and postprocessing methods, due to blood-brain barrier disruption and resulting T1-weighted leakage and T2- and/or T2*-weighted imaging (T2/T2*WI) residual effects. We set out to determine optimal DSC conditions that address these errors and maximize rCBV accuracy in differentiating posttreatment radiation effect (PTRE) and tumor. MATERIALS AND METHODS: We recruited patients with previously treated high-grade gliomas undergoing image-guided re-resection of recurrent contrast-enhancing MR imaging lesions. Thirty-six surgical tissue samples were collected from 11 subjects. Preoperative 3T DSC used 6 sequential evenly timed acquisitions, each by using a 0.05-mmol/kg gadodiamide bolus. Preload dosing (PLD) and baseline subtraction (BLS) techniques corrected T1-weighted leakage and T2/T2*WI residual effects, respectively. PLD amount and incubation time increased with each sequential acquisition. Corresponding tissue specimen stereotactic locations were coregistered to DSC to measure localized rCBV under varying PLD amounts, incubation times, and the presence of BLS. rCBV thresholds were determined to maximize test accuracy (average of sensitivity and specificity) in distinguishing tumor (n = 21) and PTRE (n = 15) samples under the varying conditions. Receiver operator characteristic (ROC) areas under the curve (AUCs) were statistically compared. RESULTS: The protocol that combined PLD (0.1-mmol/kg amount, 6-minute incubation time) and BLS correction methods maximized test AUC (0.99) and accuracy (95.2%) compared with uncorrected rCBV AUC (0.85) and accuracy (81.0%) measured without PLD and BLS (P = .01). CONCLUSIONS: Combining PLD and BLS correction methods for T1-weighted and T2/T2*WI errors, respectively, enables highly accurate differentiation of PTRE and tumor growth. We previously correlated localized DSC measurements with image-guided tissue analysis to establish rCBV threshold values that accurately identify histologically distinct subregions of tumor and PTRE within large enhancing lesions.2 Use of DSC and these thresholds provides a noninvasive diagnostic tool that can characterize lesion heterogeneity and help determine appropriate clinical management, because MR imaging lesions predominantly composed of tumor are often treated differently from predominantly PTRE lesions. In clinical practice, however, the accuracy of rCBV measurements and representative rCBV maps can vary substantially depending on the DSC acquisition and postprocessing methods due to blood-brain barrier (BBB) disruption and resulting T1-weighted leakage and T2- and/or T2*-weighted imaging (T2/T2*WI) residual effects.3–6 These effects occur commonly in both tumor and PTRE lesions and can diminish test reliability, whether the rCBV maps are evaluated qualitatively (visual inspection), semiquantitatively, or quantitatively (region of interest analysis). Thus, it is paramount that the DSC technique be optimized to prevent or correct these inaccuracies and ensure that rCBV measurements maintain their correlation with histopathology. Preload dosing (PLD) and baseline subtraction (BLS) techniques have been proposed as simple methods to minimize and correct for T1-weighted leakage and T2/T2*WI residual effects, respectively.3,5 These approaches are empiric, in contrast to mathematic modeling approaches such as gamma variate analysis.4,5,7 PLD administration of contrast agent before the DSC acquisition minimizes T1-weighted leakage effects by saturating the extravascular-extracellular-space tissue T1-weighted signal intensity, thereby diminishing T1-induced signal-intensity increases during the subsequent DSC contrast injection. The BLS correction technique applied during postprocessing integration prevents overestimation of rCBV caused by T2/T2*WI residual effects from leakage and/or recirculation, which causes persistent signal-intensity decreases following the initial first-pass contrast bolus. There is a clear need in the medical imaging community to validate DSC techniques to determine standardized methods that provide clinically reliable measurements across multiple institutions.10 These DSC methods should also take into consideration the recent linkage between nephrogenic systemic fibrosis and total contrast dosage.11 Because DSC optimization impacts both clinical safety and measurement accuracy, the ultimate goal would be to identify the DSC protocol that maximizes test reliability while, at the same time, minimizing overall patient contrast load. To our knowledge, there has not been a formal study that evaluates the dose-dependent relationship between PLD amount, T2/T2*WI correction, and rCBV accuracy to distinguish PTRE from tumor. We report a prospective study that correlates image-guided tissue analysis of enhancing MR imaging lesions with localized rCBV measurements at increasing PLD amounts, with and without BLS correction. We hypothesized that rCBV accuracy depends on PLD amount and that combining both PLD and BLS correction methods maximizes test accuracy in differentiating tumor from PTRE. Our goal was to provide recommendations that improve DSC method accuracy and standardization, to diagnose the histologic heterogeneity in posttreatment gliomas. From January 2007 to April 2008, we consecutively recruited previously treated patients with World Health Organization grade III and IV primary high-grade gliomas undergoing preoperative imaging for surgical re-resection of recurrent newly developed contrast-enhancing lesions on surveillance MR imaging. All patients had previously undergone initial treatment for their tumors, which consisted of combined surgical resection with adjuvant chemotherapy (which included temozolomide in all cases) and radiation therapy before enrollment into this study. All patient information was anonymized for Health Insurance Portability and Accountability Act compliance. The institutional review board approved our study, and each subject gave written and informed consent. The estimated glomerular filtration rate (eGFR) was calculated from serum creatinine levels, patient demographics, and age. Patients with eGFR < 60 mg/min/1.72 m2 were excluded before enrollment. For each subject, we documented the presence of steroid therapy at the time of imaging and radiation therapy timing and dose. Criteria for exclusion of MR imaging data based on quality are described in detail in the “Coregistration of Stereotactic and DSC Image Datasets” subsection. Our project design consisted of a stepwise predosing protocol by using a broad range of increasing PLD amounts and incubation times before rCBV measurements, as previously described.12 We performed 6 sequential evenly timed DSC acquisitions, each using a half-dose (0.05 mmol/kg) bolus of gadodiamide (Omniscan; Nycomed Amersham, Oslo, Norway) injected at a rate of 3–5 mL/s (followed by a 20-mL normal saline flush) on the 10th time point of each series. Each 2-minute DSC acquisition consisted of 60 time points, and 1 minute separated the end of 1 DSC acquisition and the start of the next. Thus, sequential contrast injections were separated by 3 minutes. Note that the total contrast dosage following all 6 DSC acquisitions (0.3 mmol/kg) was within the US Food and Drug Administration−approved limit for this agent. Diagram demonstrates the step-wise preload dosing (PLD) protocol. 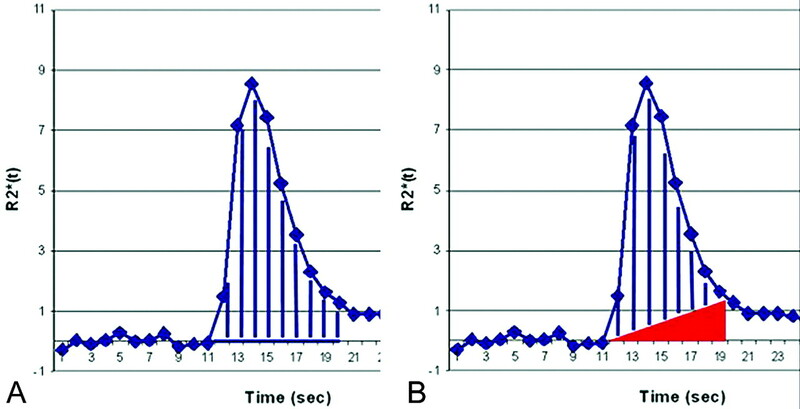 Circles depict the 6 sequential dynamic susceptibility-weighted contrast-enhanced (DSC)-acquisition 0.05-mmol/kg contrast injections, each separated by 3 minutes. Relative cerebral blood volume (rCBV) was calculated from each DSC acquisition. The PLD amount for each acquisition (ie, P2 through P6) equals the sum of all preceding contrast-injection amounts. The blue circle (P1) represents the control DSC acquisition with no PLD amount. MRI indicates MR imaging. To address this distinctly important issue of DSC−MR imaging technique optimization, our current article describes in detail the methodology, experimental results, and clinical recommendations from the aforementioned citation, which includes information from all 6 DSC−MR imaging datasets in full.12 To this end, our current purpose was to describe the effects of T1-weighted and T2/T2*WI correction on the correlation with spatially accurate histopathology, specifically regarding the presence of and variation of the preload dosage, incubation timing, and use of baseline subtraction postprocessing. Our hope is that this information further supports the need for standardization and improved accuracy of the DSC−MR imaging technique in posttreatment patients with glioma. All patients were scanned within 1 day before surgery on a 3T MR imaging magnet (Signa HDx; GE Healthcare, Milwaukee, Wisconsin) following placement of an intravenous catheter in the antecubital fossa or forearm. A standard manufacturer DSC sequence was used with the following parameters: gradient-echo echo-planar imaging (EPI) with TR/TE/flip angle (FA), 2000 ms/20 ms/60°; FOV, 24 × 24 cm; matrix, 128 × 96; 5-mm sections; no gap. We recognized differences in T1-weighted and T2/T2*WI sensitivity and image quality with different choices of pulse sequence. In our case, the longer TR enabled ample section coverage and the FA provided signal intensity–to-noise-ratio benefits. The wide availability of our chosen DSC sequence also improved the likelihood that other centers could reproduce this technique. T1-weighted spoiled gradient-refocused-echo inversion-recovery−prepped stereotactic MR imaging datasets (TI/TR/TE, 300/6.8/2.8 ms; matrix, 320 × 224; FOV, 26 cm; section thickness, 2 mm) were obtained immediately before and following DSC to guide stereotactic surgical-specimen collection. Image-guided tissue collection was performed as previously described.2 In brief, a neurosurgeon created the smallest possible diameter craniotomy to minimize brain shift and collected an average of 3 tissue specimens from each subject during surgical resection. Specimens were randomly sampled from different poles of enhancing locations within the lesion periphery. All stereotactic imaging locations were visually validated with corresponding intracranial neuroanatomic landmarks. Screen-capture images were recorded to document specimen stereotactic location for coregistration with the DSC dataset. Tissue collection was performed without knowledge of DSC measurements. Stereotactic MR imaging and the 6 DSC image datasets were transferred to an off-line Linux-based workstation to perform rigid-body coregistration by using Statistical Parametric Mapping (SPM5; Wellcome Department of Imaging Neuroscience, London, UK) to help offset EPI image distortion. Before coregistration, images in each DSC dataset were visually evaluated by a neuroradiologist with >9 years’ experience with DSC (L.S.H.) to ensure that no significant patient motion occurred during the time series. Contrast bolus susceptibility changes typically confound accurate coregistration and image realignment techniques during a single acquisition; thus, obvious motion during any of the 6 acquisitions excluded all of that patient’s data from further analysis. For the remaining subjects, the fourth DSC dataset was arbitrarily chosen to provide a mean of 2 time-series images before and following contrast-bolus passage. The stereotactic MR imaging dataset and all other DSC time-series images were coregistered to that mean image for each subject. This process corrected patient motion between DSC acquisitions. A neuroradiologist (L.S.H.) visually validated coregistration accuracy. Calculation of Cerebral Blood Volume. After excluding the first 3 data points from each time series to allow tissue signal-intensity saturation, we generated whole-brain cerebral blood volume (CBV) maps by trapezoidal integration under the ΔR2*(t) area curve from the start to the end of the first-pass contrast bolus on a voxel-by-voxel basis using 2 different methods (Fig 2): 1) integration without BLS; and 2) integration with BLS, which excluded a right triangular area whose hypotenuse was determined by the line extending from prebolus to postbolus baselines and whose height was determined by the difference between prebolus and postbolus ΔR2*(t) values.3 Trapezoidal integration provides a common, robust, and simple method compared with other techniques such as gamma variate fitting.15,16 We determined the integration interval on the basis of the first-pass ΔR2*(t) curves from normal brain parenchyma. We applied this integration interval to every voxel on the map. To account for possible noise and timing variation in the time-course data, we determined the postbolus ΔR2*(t) baseline as the average of 5 ΔR2*(t) values, which included the value at the end of the integration interval and values from the 4 successive time points. Coregistration of datasets enabled placement of 3 × 3 voxel-sized (∼0.4 cm2) regions of interest centrally within the previously recorded stereotactic dataset locations for each surgical tissue specimen. We calculated mean rCBV values and correlated these with corresponding specimen histopathology, as previously described.2 All regions of interest were inspected to ensure exclusion of visible vessels. DSC measurements were performed without knowledge of histopathology. All surgical specimens were formalin-fixed, paraffin-embedded, sectioned, and hematoxylin-eosin stained per standard diagnostic protocol at our institution. Without knowledge of DSC results, we histopathologically categorized each specimen as either tumor or PTRE, as previously described2: PTRE features included paucicellularity, lack of numerous atypical cells, lack of mitotic figures, and reactive cells including gemistocytes. Necrosis, if present, involved parenchyma rather than cellular tumor. Tumor-recurrence features included sheets and/or nests of atypical cells often with mitotic figures. Necrosis involved cellular tumor rather than parenchyma. Samples containing a mixture of both tumor and PTRE were classified as tumor, regardless of the percentage of tumor bulk. Only samples with pure radiation change (in the absence of tumor criteria) were categorized as PTRE. The sole presence of a few isolated, scattered atypical cells did not qualify as tumor categorization, as long as other neoplastic features were absent. Graph shows cerebral blood volume (CBV) calculation methods. A, Uncorrected CBV calculation by trapezoidal integration without baseline subtraction (BLS). B, BLS integration excludes a triangular area (red) that estimates the T2/T2*WI residual effects. The remaining area under the curve (AUC) (blue lines) estimates the corrected CBV. Graph shows CBV over an increasing PLD amount from normal-appearing gray matter (GM) and white matter (WM) regions of interest. CBV values are calculated by using BLS integration. We performed a primary analysis for all rCBV datasets by generating receiver operator characteristic (ROC) curves to distinguish tumor and PTRE samples. This was done for rCBV datasets acquired following all 6 PLD amounts and calculated both with and without BLS postprocessing. Thus, a total of 12 ROC curves were generated for the 36 tissue specimens. Areas under the curve (AUCs) were calculated for each ROC and statistically compared by using the Delong Delong Clarke-Pearson method. Sensitivity, specificity, and 95% confidence intervals (CIs) for distinguishing PTRE and tumor were generated from each ROC curve at a number of rCBV cutoff points (Analyse-it Software, Leeds, UK) to determine the optimal threshold value that maximized accuracy (defined as the average of sensitivity and specificity). To evaluate possible covariance grouping effects from multiple intrasubject specimens, we performed a secondary analysis of ROC curves for all 12 conditions by using a smaller set of samples. We limited this analysis to single randomly selected specimens and corresponding rCBV values from each subject. We calculated AUCs for ROC curves and statistically compared them by using the Delong Delong Clarke-Pearson method to evaluate for the similarity in trends to the first analysis of the complete dataset. Results of the secondary analysis trended in the same direction as those of the primary analysis, though the secondary analysis did not reach statistical significance, likely due to the reduced sample size. Results of the primary analysis are presented herein. A biostatistician (A.C.D.) performed all analyses. Initially, 40 tissue specimens were collected from 13 subjects; however, 4 samples from 2 subjects were excluded from the data analysis due to motion during ≥1 of the sequential DSC acquisitions. A total of 36 tissue samples (11 subjects) were included for final data analysis and categorized as tumor (n = 21) or PTRE (n = 15). The group mean and SD of craniotomy diameters were 3.97 ± 1.71 cm. The average tissue-specimen volume was approximately 0.3 cm3. Table 1 summarizes the patient demographics, subtype and grade of originally treated tumor, presence of steroid therapy, and radiation therapy type and timing. Of the 11 subjects, 3 (27.2.%) had only PTRE specimens, 5 (45.5%) had only tumor specimens, and 3 (27.2.%) had both types of specimens. 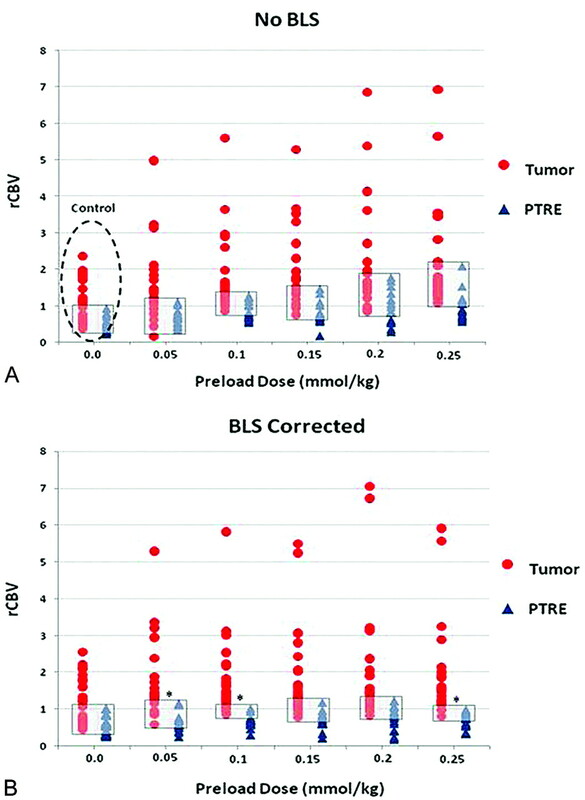 Figure 4 summarizes the primary analysis results and the distribution of rCBV values for the tumor and PTRE groups for the 12 DSC methods, with respect to PLD amount and presence of BLS correction. Uncorrected test AUC (0.85) in the absence of any type of correction (either PLD or BLS) represented the comparison control, with a maximized test accuracy of 81% (sensitivity, 61.2%; specificity, 100%) over an rCBV threshold value range between 0.93 and 0.97 (95% CI, 58.3%–91.0%). BLS correction alone (in the absence of PLD correction) did not result in an appreciable increase in test AUC compared with that of controls. As PLD amount and incubation time increased, trends demonstrated that the test AUC increased in the absence of BLS; however, for no PLD amount (in the absence of BLS) did the AUC increase reach statistical significance compared with that of the control. 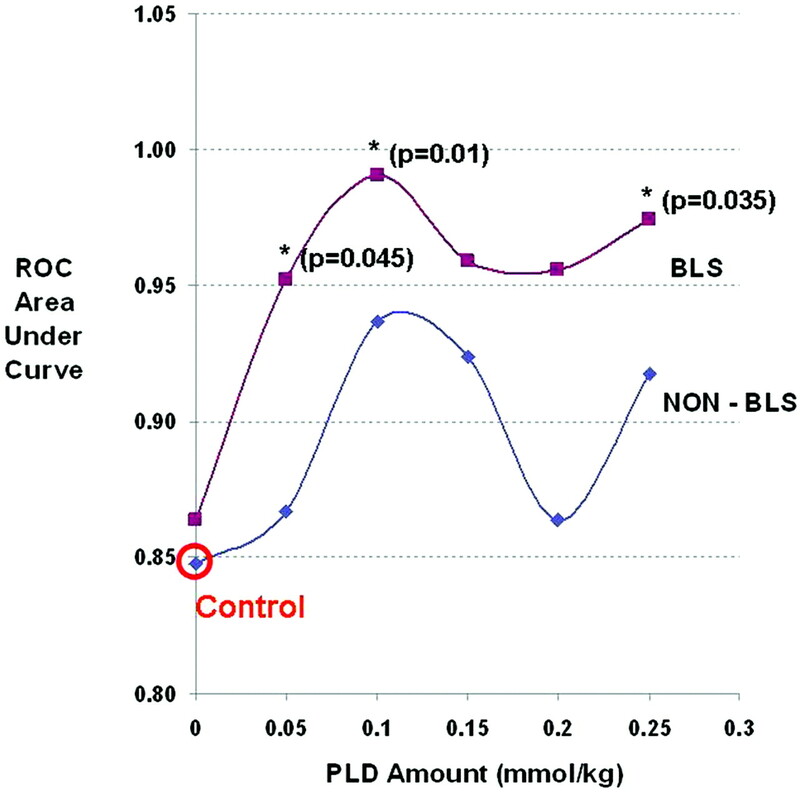 When PLD and BLS correction methods were combined, test AUC significantly improved at specific PLD amounts and incubation times (Figs 4 and 5). Table 2 summarizes the percentage of tumor and PTRE specimens that were correctly diagnosed by rCBV measures by using the 12 specific PLD and BLS protocols. The protocol using a 0.1-mmol/kg PLD amount, an incubation time of 6 minutes, and BLS correction yielded the highest test AUC (0.99), with a test accuracy of 95.2% (sensitivity, 90.5%; specificity, 100%) over an rCBV threshold value range between 1.02 and 1.04 (95% CI, 73.9%–99.4%), while minimizing contrast dosage to the subjects. Graph shows distribution of rCBV values for tumor (red circles) and posttreatment radiation-effect (PTRE) (blue triangles) groups over the increasing PLD amounts without BLS (A) and with BLS (B). Gray boxes depict the range of overlapping rCBV values between groups under each condition. Asterisks in B denote conditions that demonstrated statistically significant increases in the rCBV receiver operator characteristic (ROC) AUC compared with the control acquisition (dotted circle). These are observed with BLS and PLD amounts of 0.05 (P = .045), 0.1 (P = .01), and 0.25 (P = .35) mmol/kg, with incubation times of 3, 6, and 15 minutes, respectively. Graph shows the effects of PLD amount and the presence of BLS correction on DSC test accuracy (represented by ROC AUC). Asterisks (with P values) denote test conditions that demonstrate a statistically significant increase in rCBV ROC AUC compared with the control acquisition (red circle). Combining T1 leakage and T2/T2*WI residual correction is necessary to maximize test accuracy. The PLD amount of 0.1 mmol/kg should be administered 6 minutes before the DSC acquisition injection to minimize T1 leakage effects. BLS integration, or some other comparable T2/T2*WI correction, should be performed during postprocessing CBV calculation for T2/T2*WI leakage correction. If time permits, conventional imaging could proceed during the “downtime” of the incubation period to help offset time delays in a busy clinical practice. 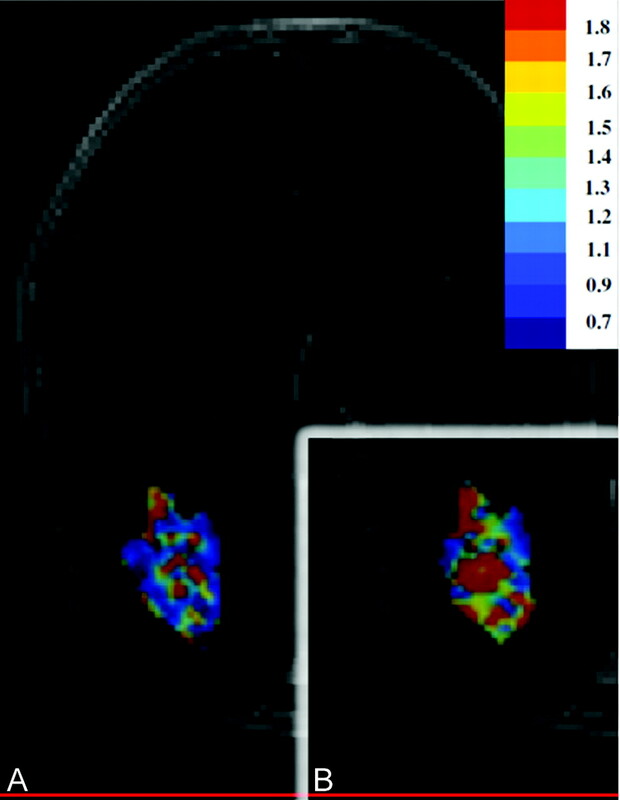 Graph shows that representative rCBV color maps are obtained with 2 different DSC protocols and are subsequently masked and overlaid on the same contrast-enhanced MR imaging lesion, with identical color scales that progress from blue (low) to red (high). A, Before leakage correction, the lesion inaccurately demonstrates an even mixture of tumor and PTRE voxels based on uncorrected rCBV. B, Following PLD-BLS (0.1 mmol/kg) correction, rCBV increase demonstrates a greater abundance of tumor voxels. Previous studies have discussed how both T1 and T2/T2*WI leakage effects can confound accurate DSC measurements.3,5 T1-weighted leakage effects increase signal intensity and compete with susceptibility-induced signal-intensity decreases, resulting in an underestimation of rCBV;4–6,13 T2/T2*WI residual effects magnify signal-intensity decreases and overestimate rCBV.3,5 In reality, both effects are variably present during rCBV measurement, though technical and physiologic factors influence which effect predominates.3,5 A variety of possible correction algorithms have been proposed; however, we chose the PLD and BLS methods because they are each robust and technically facile, increasing the likelihood that a broad range of institutions and clinical practices could implement these optimization techniques. 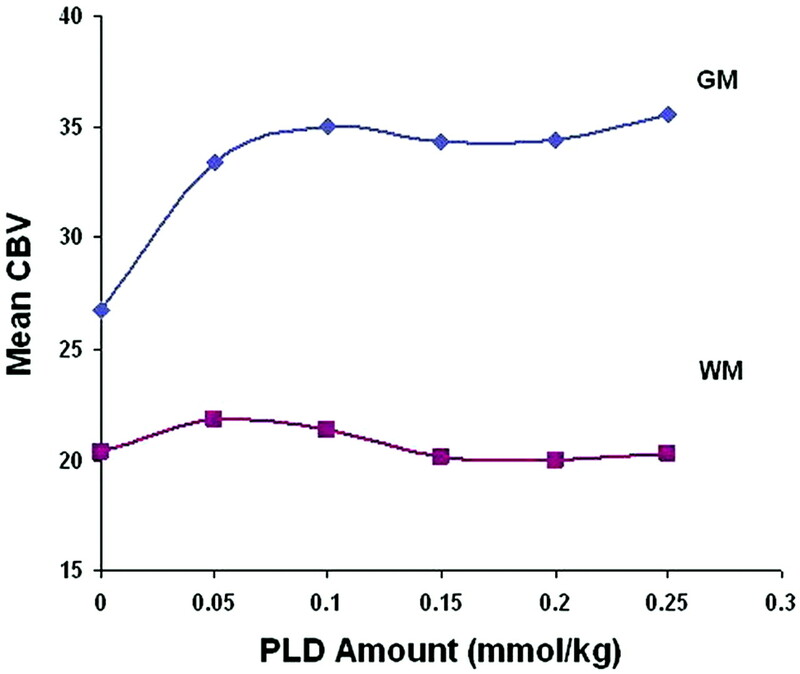 Multiple factors can influence the adequacy of PLD correction of T1-weighted leakage effects. Previous studies have proposed PLD dose-dependence;5,13 however, even if the PLD amount is maximized, the incubation time that allows the preinjected contrast agent to diffuse into the extravascular-extracellular-space tissue plays as important a role in adequate correction as the amount itself. Boxerman et al4 administered 0.1-mmol/kg PLD immediately before the DSC injection for rCBV measurement but reported insufficient correction. Conversely, Kassner et al5 reported sufficient correction with the equivalent PLD amount by waiting an incubation time of 6–10 minutes before the DSC injection for rCBV measurement. Their study at 1.5T is in agreement with our current results and the previously reported protocol at 3T.2 We administered the total PLD amount of 0.1 mmol/kg via 2 separate injections. We suspect that administering the total dose via a single injection 6 minutes before the DSC acquisition would yield comparable results. Nonetheless, current ongoing studies at our institution will help confirm this through clinical validation. The type of contrast agent can also affect the degree of observed T1-weighted effects, as well as the efficacy of correction methods. Although this study evaluated gadodiamide, the contrast agent gadobenate dimeglumine (Multihance; Bracco, Milan, Italy) demonstrates approximately twice the in vivo T1 relaxivity as gadodiamide at equivalent doses, which suggests that there would be a greater T1 leakage effect with gadobenate. However, at the same time, the preloading dose of gadobenate may be more effective as well.13 This relationship may be confounded by gadobenate protein binding, which can offset the degree of extravascular contrast extravasation. Preliminary studies at our institution suggest that both contrast agents demonstrate approximately equal T2/T2*WI effects at equivalent doses. Regardless, further study is needed to help resolve these issues, particularly at high field strengths. There are several possible limitations to our study. The minimum PLD and incubation time to achieve adequate T1-weighted leakage correction may vary within different lesion subregions or from patient to patient due to a number of physiologic factors, including different degrees of BBB disruption and local contrast diffusion rates.5 Differences in steroids and chemotherapies may further exacerbate this heterogeneity. Nonetheless, our correction methods significantly improved test accuracy in our population, suggesting the clinical robustness of this technique. Addressing the above-mentioned heterogeneities by using other techniques that specifically evaluate vascular permeability, including dual-echo dynamic contrast-enhanced MR imaging and mathematic modeling, may further improve test accuracy in some cases.3,4,18,19 Formal studies comparing PLD and BLS methods with the aforementioned techniques would be beneficial. Although our 3T study used a smaller contrast dosage for each bolus injection compared with that in most reports at 1.5T, DSC imaging at a 3T field strength has been shown to provide similar data quality with a lower necessary dosage compared with 1.5T.20 We confirmed this in our study because we observed sufficient quality of contrast response to generate highly accurate rCBV measurements. In fact, the possibility of lowering the total contrast load may be viewed as a potential advantage to DSC imaging at higher field strengths. We also recognize possible limitations regarding our subject population and tissue specimens. Our relatively small sample size relates, in part, to the expected inherent obstacles in prospective recruitment of patients with recurrent glioma undergoing surgical resection. Also, we excluded a portion of our subject population and tissue samples due to inadequate image quality from motion artifacts. In this study, we assumed that each of the tissue specimens and their respective rCBV values represented independent measures, despite the fact that patients often provided multiple specimens. In all cases, tissue specimens were taken from distinct and spatially isolated locations within the periphery of large enhancing lesions. Similarly, the regions of interest for rCBV calculation for corresponding specimens were also spatially distinct, without voxel overlap. We realize that certain intrasubject physiologic factors may influence DSC measurements for multiple specimens similarly within a particular subject. For instance, each subject’s cardiovascular and renal status may influence the shape and quality of the contrast bolus arterial input and/or the contrast agent clearance from the blood pool and extravascular extracellular space. Our secondary analysis addressed these issues of covariance grouping effects, at least in part, by limiting analysis to single randomly selected specimens from each subject. This analysis showed trends that were similar to those in our primary analysis of the complete dataset and suggest the absence of large intrasubject covariance. BLS effectively corrects T2/T2*WI residual effects, which are often prominent following PLD administration.3,5 In our study, BLS proved necessary to achieve the highest degree of rCBV accuracy following PLD administration of 0.1 mmol/kg and an incubation time of 6 minutes. rCBV accuracy slightly diminished following PLD amounts exceeding 0.1 mmol/kg, both in the presence and absence of BLS correction. It was not until PLDs and incubation times reached 0.25 mmol/kg and 15 minutes, respectively, that accuracy increased again. There is evidence that T2/T2*WI leakage effects may be dose-dependent.5 One hypothesis to explain our results is that high PLD amounts (>0.1 mmol/kg) may lead to contrast agent accumulation in the extravascular extracellular space or vascular blood pool, magnifying T2/T2*WI residual effects. It is possible that longer incubation times (≥15 minutes) may allow enough fractional clearance of the contrast agent from the blood pool or extravascular extracellular space to diminish these effects.21 Wedeking et al21 reported an 80% decrease in the gadopentetate dimeglumine plasma concentration by 15 minutes following injection in animal models. The entity “pseudoprogression” has been introduced in recent literature and describes how posttreatment reactive changes, typically resulting from a combination of radiation therapy and temozolomide, can mimic tumor recurrence primarily radiographically and clinically within months following treatment.24 Histopathologic diagnosis remains the criterion standard in these patients, though accurate diagnosis can be difficult in some cases.24 Specific histopathologic diagnostic criteria that can help improve accuracy were used in this study.24,25 Nonetheless, we recognize that diagnostic criterion standards are not completely accurate and thus present a possible limitation to this study. rCBV accuracy in posttreatment gliomas depends on PLD amount and incubation time to minimize T1-weighted leakage effects as well as the presence of BLS correction to overcome T2/T2*WI residual effects. Combining the 2 methods significantly improves rCBV correlation with histopathology and enables highly accurate differentiation of PTRE and tumor growth. We thank Mary Harrigan, Scott Beeman, Mike Purcell, and Brian Lenoski for their assistance. We also thank Zerrin Yetkin, MD, for her guidance and thoughtful discussions regarding this topic. We also appreciate the support of the Barrow Neurological Institute (BNI) Tumor Board, BNI patients, and their family members. This work was supported in part by the Barrow Neurological Foundation, Phoenix, Arizona, Bruce T. Halle Family Foundation, and Arizona Biomedical Research Commission. Paper previously presented in part at: 16th Scientific Meeting and Exhibition of the International Society for Magnetic Resonance in Medicine, May 3–9, 2009; Toronto, Ontario, Canada. Accepted after revision June 10, 2009.